This page offers a compilation of tips and advice to help you better understand and use Kitlinx.com to the fullest potential. Kitlinx is the "Link" between the "Kit" and the "Hobbyist". It provides links between numerous reliable suppliers to source your hobby needs. SKUs in stock at Kitlinx.com: 16,000 (~20%) - that means that we currently have these items IN STOCK in our warehouse in the state of Utah, USA, ready to ship immediately. The percentage is taken from the in stock items divided by the overall available items on the website. Available from US & European Suppliers: 94,000 - that means that these products are available FOR PURCHASE on the website. Kitlinx. There are also about 7,000 'Out of Stock' and 1,000 'Pre-Orders'. This is a table taken at a given time above showing how these products are divided. Kitlinx is proud to claim a 99.5% success rate in sourcing products! Mistakes can sometime occur in the database (requiring regular stock assessments), misplacing a product on a shelf, or a mistake in a supplier's database. Kitlinx Home Page - New Items: Every day, we announce NEW ITEMS, listed by date. A RED ROCKET means the product is in stock, a BLUE ROCKET means the product is not in stock but still available for purchase. Most of these searches are sub-divided by scales or subjects. Quick Search - top blue bar, left box. Just type away! Put several keywords: '1/24 Lamborghini' gives me 56 results! Related Items - On most item pages you will find "Related Items, click here". This link will take you to a selection of products related to the product you are currently viewing. Reviews - Reviews are located below the top product image on the item page. Kitlinx is linked to over 20,000 independent reviews from websites we usually sponsor including Hyperscale, Large Scale Planes, Internet Modeler, Cybermodeler, and many more. If you have reviews to share, send us the link and the SKU of the product it relates to. Scalemates: scale modeling database | stash manager - Kitlinx supports and sponsors Scalemates. When a product has the Scalemates logo, you can click on it and it will take you directly to this amazing website with price comparison and availability and much more. There are currently about 40,000 links available. Review a Product - Customers are sent an automated email asking them to review the products they just purchased. Please take the time to quickly give your opinion. Please be "fair" to the Product/Manufacturer, after all the quality of a model is often related to the skill of the builder! As my mother used to say: "if you don't have anything nice to say about it, just don't say anything"... Let's make constructive comments. Blog - Kitlinx offers a blog to customers, which often is used to announce full line restocks and post newsletters. You can find it on the homepage - bottom of left column or click on the "Blog" link on the main menu - YOU CAN COMMENT on the blog! 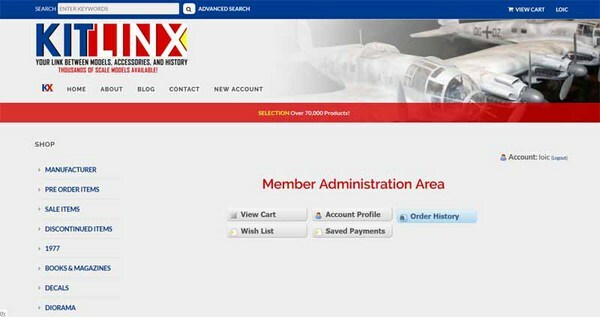 You can view your order status when you are logged in to the website. There is NOTHING Kitlinx can do about shipping rates except lose some profit margin in a tight business environment. The automated system during check out takes the weight of each item, and calculates the shipping rate. Kitlinx will optimize this rate if the package can ship via USPS Priority Mail, which is only 2-day-shipping to the East Coast! Kitlinx currently uses a "Freight Allowance" which gives the customer a 2% kickback above $300 orders. The automated shipping calculator is NOT ALWAYS accurate, so if you have some incomprehensible rates, just contact us loic@kitlinx.com. Often it can be related to mistakes in weight or size estimations. Kitlinx will ship MOST packages via USPS Priority Mail if it makes sense money-wise. It is 2-day transit from Utah to ANY destination in the contiguous US States. Over-sized or heavy packages going to the East Coast might be changed to FedEx. First-Class packages include a tracking number, for any request below 1 lb in the US, or below 4 lbs over-sea. First-Class tracking numbers for over-sea packages will NOT work past the US port. All shipments include a tracking number, automatically sent from our system, when your order is closed or has been shipped. You might have noticed that Kitlinx REMOVED the Membership requirement. If you have shopped at Kitlinx already, then you most likely benefited from a $0.99 membership cost! If you paid for the Membership and never ordered, please contact us and we will refund you the $0.99 or put a credit on your account. This membership created some issues, so Kitlinx decided to extend the extra 5% discount when the product is NOT in stock. If the product is NOT in stock, you will automatically get a 5% extra discount. It's Kitlinx's way of saying 'Thank you' for trusting our system. Discount appears in your shopping cart. If you order OVER $300 worth of products, you will automatically get a 3% extra discount. It is called "Freight Allowance". It is COMBINED with the above discount if available. On the left Column, you can search for SALE ITEMS in various scales. Kitlinx will have sales from time to time, announced in its weekly Newsletter. Join our mailing list to be the first to receive notifications. Many customers complained that the login and account creation did not work well. We've asked our programmers to change this process and make it smoother. Just remember: lower case characters only for username. Passwords are case sensitive. Kitlinx accepts orders via mail and accepts checks. Please allow added time for the mail to arrive and the check to clear the bank. We currently do not have a phone/fax line with a DEDICATED customer support. However, we are looking to implement these services SOON. Printed catalog is a service that John/Mary @ Roll-Models were offering to their customers. Kitlinx has its entire inventory listed online, but some of you want to TOUCH the extensive catalog. John's catalog is 188 pages and Kitlinx will also implement a similar catalog after we figure out how to 'semi-automate' this process. Since we carry almost DOUBLE the inventory available at Roll Models, we decided to make THREE catalogs starting in 2019. Kitlinx received a LOT of inquiries about whether the awesome lines that Roll Models carried will be available at Kitlinx. OF COURSE! We are carrying all of these lines, except that you will see through the months/years to come that we tend to increase our stock levels of the BEST SELLERS.